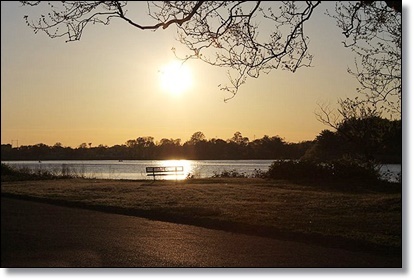 A father and son fishing at a New Jersey lake may be lucky their bodies still have all their pieces after catching a fish called 'the Nutcracker' that is more commonly seen in the Amazon. 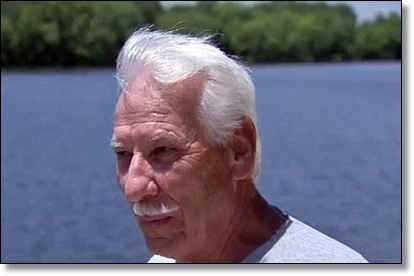 Ron Rossi, from the Philadelphia suburb of Delran, was out with his son Frank at a man-made body of water when they hooked what they thought was a piranha. 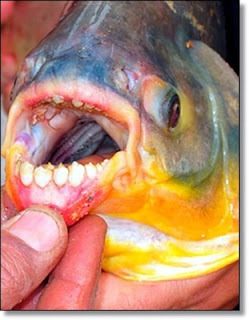 However, the rare species in Swedes Lake was actually a pacu, an omnivorous fish native to Brazil that has human-like teeth and has been reported to eat the testicles of swimmers and fishermen. The Rossis realized the bizarre find when they went home and researched the animal after being confused at its lack of sharp, piranha chompers, they told WPVI. Department of Environmental Protection officials said the South American fish are sometimes kept as pets, who may have dumped the pacu into the lake. 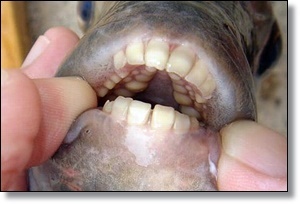 The species can grow up to four feet long and uses its molar-like teeth to crush food that falls into the Amazon River. Many pet owners mistakenly think they are piranhas when they purchase the more famous species's cousin, which can grow up to 55lbs. Given the fish's worldwide popularity, it turns out that the Rossis did not make the surprise catch of the century, or even of the last couple years. A 10-inch pacu was caught in northern New Jersey in September 2013, followed by 17-incher in Washington state, a 20-inch specimen in southern Illinois two months later and a 14-inch pacu in Michigan's Lake St Clair last summer. The fish's worldwide popularity has seen them spread far from their Brazilian homeland, with the fish being found in Paris, Scandinavia and Oceania. In Papua New Guinea, where the fish is known as the 'Ball Cutter', a member of the species is thought to have contributed to two men's death from blood loss after it castrated them. 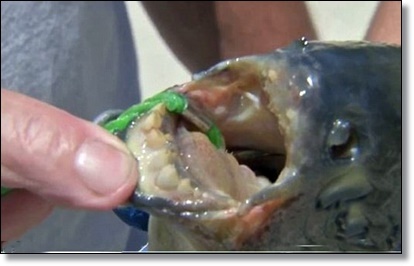 Scientists in Denmark said that reports of pacu eating genitalia were 'overblown' after they issued a joking warning to male swimmers to beware following a sighting of the fish, according to National Geographic. 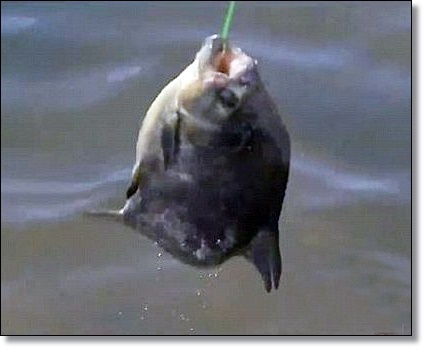 Some wildlife experts worry that the introduction of pacu into lakes such as the one in New Jersey may endanger local fauna. However, pacu cannot survive in colder water and the DEP urged owners of the fish to 'humanely destroy' it rather than throwing it into nearby waters. 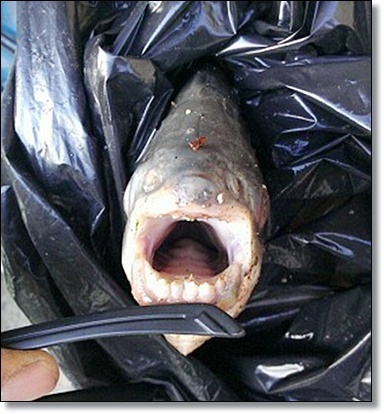 A New Jersey man was surprised when he thought he caught a piranha, but the fish turned out to be a pacu, an Amazonian fish famous for eating men's private parts. The Swedes Lake catch was the latest in an increasing number of pacu being found outside of their native habitat.